Learning objectives: To understand the role of medical prophylaxis after curative ileocecal resection for CD. To learn about the most recent evidence on endoscopy guided medical prophylaxis. To learn about treatment algorithms tailored to prognostic markers and ongoing colonic or extraintestinal disease. 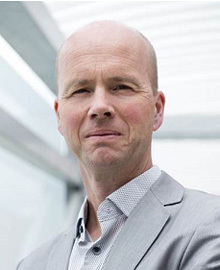 Gert Van Assche is Professor of Medicine in the Department of Clinical and Experimental Medicine at the University of Leuven. His research focuses on novel therapies in inflammatory bowel disease (IBD), fibrogenesis, and mucosal immunology in IBD. He is a staff physician in the Division of Gastroenterology at the University Hospitals of Leuven, where he also serves as Clinical Operational Officer in the Board of Directors. He is the incoming chief of the joined division of Hepato-Gastroenterology. Dr Van Assche received a bachelor's degree in philosophy and his medical degree from the University of Leuven. He subsequently trained in internal medicine and gastroenterology in Leuven. From 1994 to 1998, Dr Van Assche combined his GI fellowship with a doctoral program on regulatory peptides in motility and inflammation in the GI Hormones Lab in Leuven and the Intestinal Diseases Research Program at McMaster University, Hamilton, ON, Canada. From 2012 until 2013 he was Director of Clinical and Translational IBD Research at Mt Sinai Hospital, Toronto and Professor of Medicine at the University of Toronto, ON, Canada and he currently is Clinician Adjunct at the UofT. For his research, he received grants and awards from the Flemish Foundation for Scientific Research (FWO Vlaanderen), the Désiré Collen Research Foundation, the Royal Society of Medicine, and the Inbev-Baillet Latour Foundation. Dr. Van Assche’s scientific work has resulted in authorship or co-authorship of more than 200 peer-reviewed papers. He has been consulting several pharmaceutical companies for IBD clinical development programs. He holds a senior clinical research position at the Flemish Foundation for Scientific Research (FWO Vlaanderen).